Focus on where you WANT the ball to land. 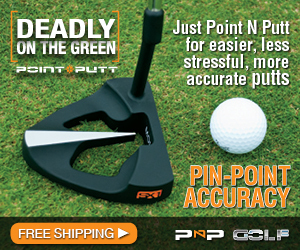 We all know that putting is one of the most important aspects of golf. But an equally important aspect is what are you actually putting for? Are you normally putting for par or bogey? Or do you generally hit the greens in regulation and end up putting for birdie? 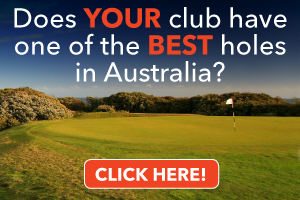 This will generally depend on whether or not you have hit a good tee shot. Golfers generally have a tendency to step up on the tee and straight away focus on where they DO NOT want to hit the ball. They will generally stay focused on that section of the hole, and then wonder why they end up driving it in the garbage all the time. Fortunately, this is just part of what we call “Human Nature”. 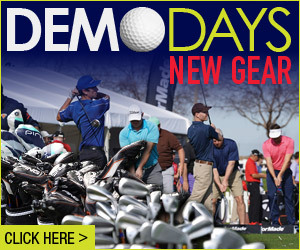 But there is actually a simple fix that will improve your golf immensely. 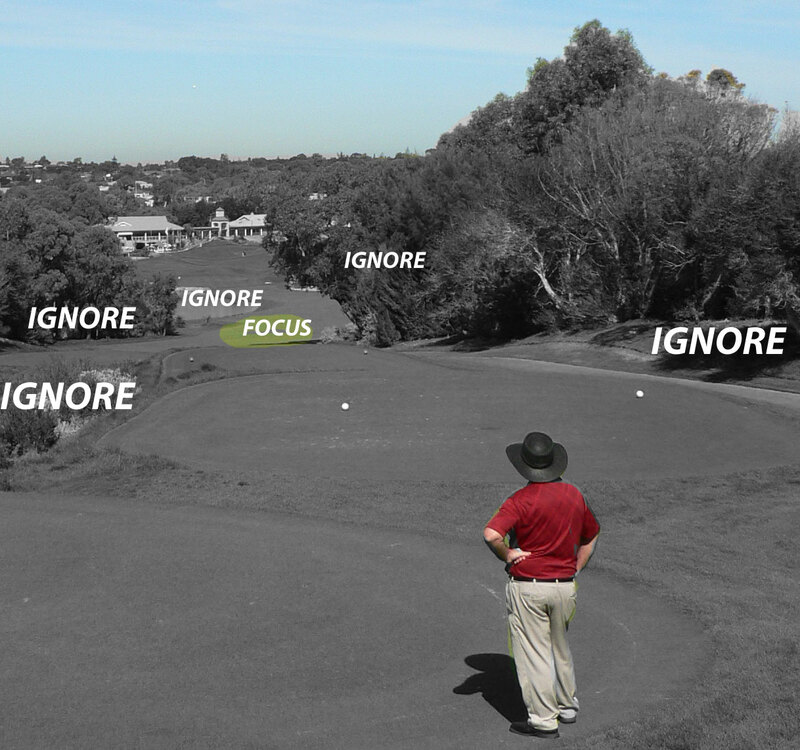 Narrowing your focus is one of the most powerful tools when it comes to driving the ball in the fairway. There are two different types of Focus: Focus of Vision and Focus of Thought. In this article we are going to discuss your Focus of Vision. 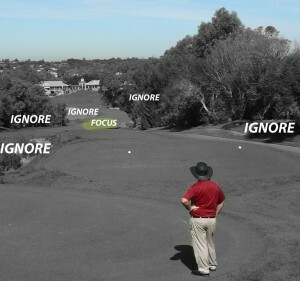 Focus of Vision is all about what your eyes are looking at in the pre-shot routine phase. 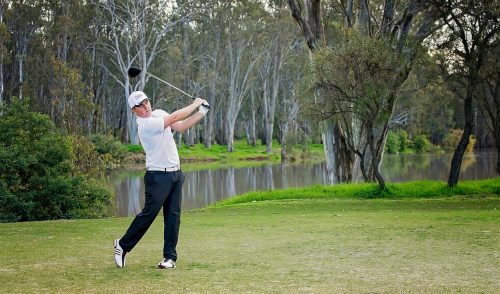 Are your eyes focused on the massive lake that juts into the fairway… or the thick tree that is hugging one side of the fairway? If that’s the case, you are setting yourself up for disaster and a round that is plagued with pressure. 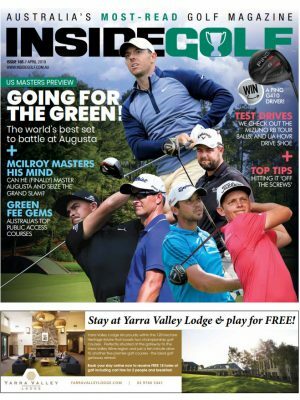 You see, when the eyes are focused on a specific part of the hole – whether it be a landing zone, bunker or whatever — when you then look down at the ball to start your swing, your mind will have that section of the hole in clear view. Even if you have said to yourself “Don’t hit it there”. It’s the same as the old saying “Don’t picture a Pink Elephant” — you almost always see the pink elephant or you might see something totally opposite. Now how does this impact our drives? If you say you don’t want to hit it in the bunker, your brain will either have a clear picture of the ball going into the bunker or will create a picture of anything else…and as we know with golf, there are a lot of anything else’s. 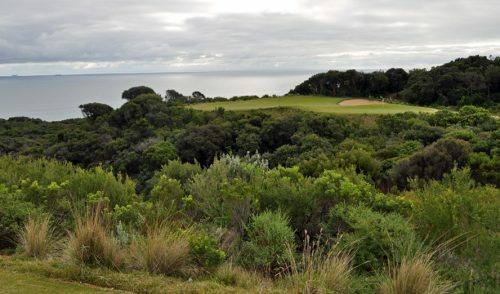 If you can pick a small, specific target in the distance of where you WANT your ball to finish–making it something that you can recognize after you have taken your eyes off that spot– then you are going to have a great chance of having your brain create pictures of where you want the ball to finish. A very useful thing in the game of golf! 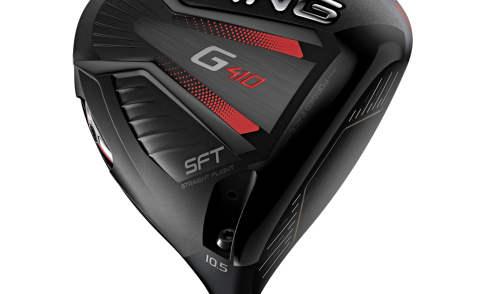 So, before you take the club away, make sure that your last look towards the target is focused precisely on that specific spot…whether it is in the middle of the fairway or any other specific landing zone you have identified. If you can do this, you will have greater control over what types of images your brain creates before you start your swing, and that has to be a good thing! One Response to "Narrow your FOCUS for better tee shots"
This is really good advice and something that all golfers should be doing. I try to do this every time I step over the golf ball. I focus on where I want the ball to go and not where I don’t want it to go.